While Pixel Perfect could have been an interesting addition to the block-style exploration genre, as typified by Terraria and such games, it's actually a pretty woeful experience that is not worth looking at, even if you are a die hard genre fan. In the game, you take the role of a pirate captain and must find a crew, build up your ship then set sail on the ocean looking for adventure. The game's style is that of a sandbox/open world type game, so you can pretty much do what you want, with activities including raiding and stealing in order to make yourself rich. The whole thing is played in 2D side scrolling fashion, with a procedurally generated world, an extensive loot system, lots of upgradeable items to buy and equip your crew and ship with, and all sorts of other secrets to discover. In theory, this all sounds like it could have been a fun if unoriginal little game. 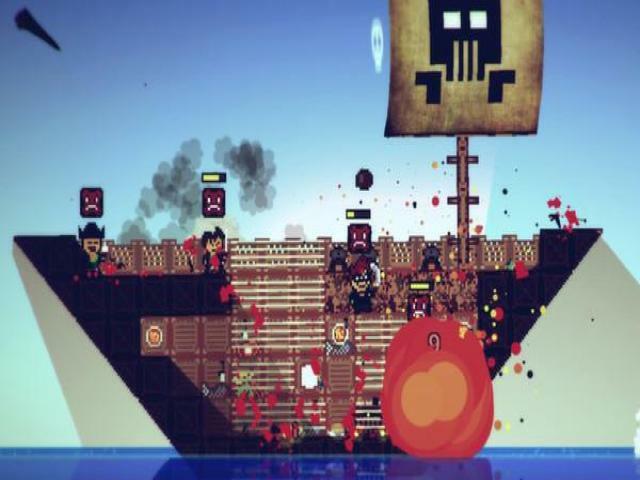 The pirate theme is usually a winner if done right, and lends itself well to the style of gameplay on offer. However, Pixel Piracy pretty much gets everything wrong. The first couple of hours might not seem too bad, as you explore and build up your ship, but it doesn't take long to discover that this is an open world with next to nothing to actually do, so it gets tedious pretty quickly. The game also suffers from a number of dodgy mechanics, which further highlight the frustration factor, while it's laden with crippling bugs which are just the nail in the coffin. When you add all these issues together, you are left with a big fat clunker of a game.